POSTS What’s the Best Home Smith Machine? What’s the Best Home Smith Machine? Are you looking for a safer way to workout without needing a spotter? If so, smith machines can be fantastic pieces of equipment. They let you push yourself to failure and not have to worry about getting stuck underneath the bar. The hook and pin systems are super easy to use. I highly recommend the Inspire Fitness FT2 smith machine. It’s one of the best smith machines for more experienced lifters as it comes with an incredible amount of additional workout attachments. The weight capacity is also impressive. We’ll also take a look at a more affordable smith machine, as well as a mid-range one. 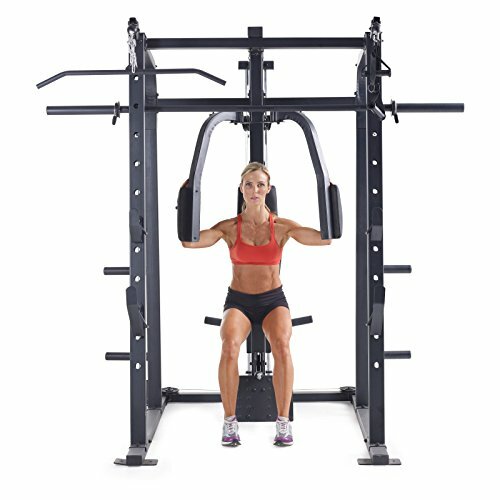 That way, you’ll have a better idea of what these smith machines have to offer across the various price ranges. This is a smith machine that serious lifters will love. Often times, home smith machines have a lower cap on their maximum weight. I found this one provides you with more than most people will ever need. The way they’ve designed the weight stack means that you’re able to workout each side of your body more precisely. A lot of smith machines can feel uneven and it results in an unbalanced physique. If one side is being worked more than the other, it will show after a period of time. This isn’t a problem you need to worry about with the Inspire Fitness Ft2 smith machine. Furthermore, the weight stacks have a maximum capacity of 150 lbs on each side. 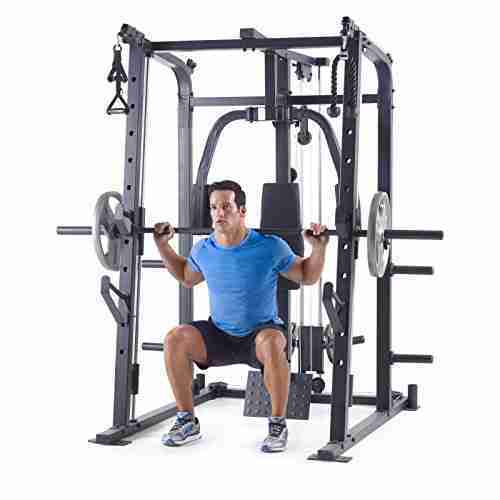 As a result, this smith machine is a fantastic choice for serious lifters. If 150 lbs isn’t enough, you can always make an upgrade to have a limit of 200 lbs. Moreover, there’s a force multiplier feature that doubles the amount of weight you’re lifting. With an upgrade and force multiplier in use, you can have a total of 800 lbs! The smith bar that’s integrated into this fitness machine is unique. It doesn’t require you to load each side with plates. Instead, it’s already hooked up to the weight stack. I liked this feature as it means there’s less hassle involved with changing the weights. It comes with an excellent lockout feature too. This lets you keep it out of the way when you’re not using it. Furthermore, there are safety latches located that allow you to easily hook the bar at any stage of the movement. This is a must-have feature of smith machines as it allows you to safely push yourself to the max. If you can’t get the rep with a barbell, you need a spotter to help. But with this smith machine, you can simply use the latches to hold the bar. 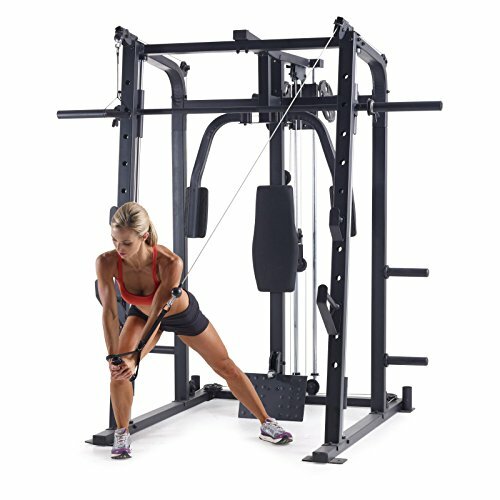 Since this smith machine is priced quite highly, you would expect it to come with a variety of workout features. And it does. There’s a preacher curl and leg extension. When you use the preacher curl attachment, you’re able to completely isolate your biceps. In particular, preachers curls are a fantastic exercise for building up the peak of the biceps. In addition to the preacher curl, you also get to use a let extension. This connects to the weight stacks and allows you to isolate your quadriceps. Leg extensions are fantastic for isolation work to increase the size and definition of the quads. Personally, I also like to use the leg extension as a warm up at the start of my workout. It helps to get the blood flowing around the knees to prevent injuries. A pull-up is also included. I appreciate when smith machines include this as it’s such a simple and effective exercise to build width in your lats. 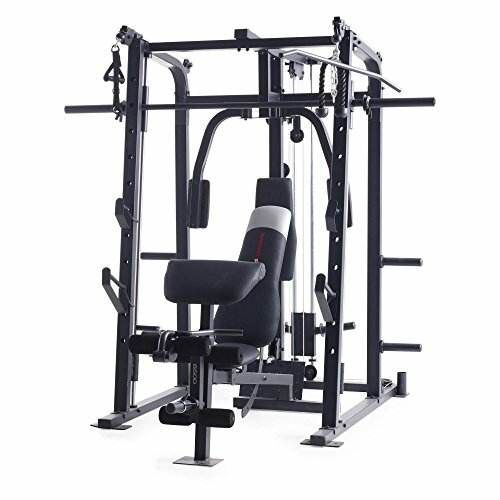 We liked how the dual pulley system equipped with this smith machine has many adjustable features. You’re able to adjust it to your exact preferences as there are 32 total positions to set the pulleys at. Therefore, you can use it for a wide variety of exercises. Using one side of the pulley is awesome for doing tricep and bicep work. Whereas using the two of them together allows you to perform chest flyes. If you have the bench, you could do these on a flat or incline. Alternatively, doing them standing upright is fantastic for isolating the chest too. For a smith machine that’s under $1,000, I was surprised to find how durable it is. Moreover, it comes with a wide range of fantastic features that enhance working out. This Weider PRO 8500 smith machine comes with a built-in smith bar. This lets you perform some of the main compound exercises, such as squats, bench press, and shoulder press. I liked how it comes with various safety pins that are located up and down the rails. This allows you to simply rack the bar if you think you can’t get the rep.
Customers have been loving how smoothly the smith bar glides up and down while in motion. 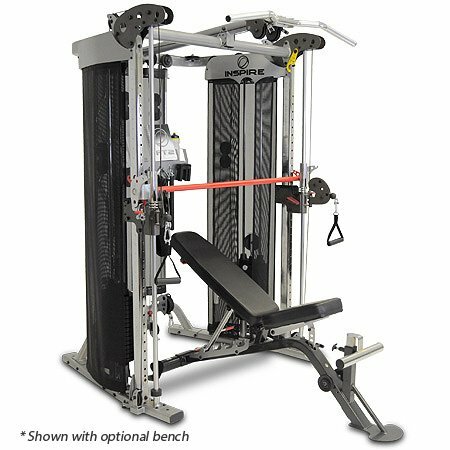 An adjustable bench is included with this smith machine as a standard order. You’re able to adjust the bench to various inclines which provides you with more workout options. Setting it flat is great for flat bench press, whereas the incline is an excellent option for hitting the upper chest. It can also be set to a more upright position for shoulder presses. In addition to the bench, you also get numerous other attachments. This includes a leg extension and preacher curls. The leg extension lets you focus on your quadriceps and the preacher curl helps you isolate your biceps. Furthermore, there are different attachments for the pulley system too. The pulley system that comes equipped to this smith machine is fantastic. You can use the various cable attachments to perform a versatile range of exercises. These include chest flyes, tricep pushdowns, lat pulldowns, rows, and face pulls. While you can use the cable mechanism to do chest flyes, there is also a designated chest fly available too. It’s a pec dec that works effectively to help you target your chest. I found the pec dec puts minimal stress on your shoulders, which helps to prevent injury. It’s a very basic smith machine that provides you with the bare essentials. Having said that, what it does provide is of a very high standard. I liked how there are a variety of positions available with this smith machine. You’re able to use 14 in total. What’s the benefit of this feature? Having the ability to choose between so many adjustment settings increases the number of exercises you can do. Furthermore, you’re able to set the starting point of the exercise to your preference. For such an affordable smith machine, I was surprised to find how durable it is. They have used heavy-duty 12-gauge steel to construct the frame. Therefore, you can expect it to last you a while. This also means that you can workout safely and not have the worry about how stable to smith machine is. The smith bar has a diameter of 1”. Powerline designed it this way to mimic the feeling that you get while lifting with Olympic equipment. There are two carriages on either side of the bar that have been made with super-glide nylon bushings. As a result, you’re able to workout with complete smoothness. Adding plates to either side of this smith bar gives it the feeling of a free weight barbell. However, this smith bar is safer due to the two hooks that are attached to it. These allow you to twist the bar and latch onto the pins that are located up and down the siderails. So, if you can’t get that last rep, you don’t need to panic as the pins have you covered. 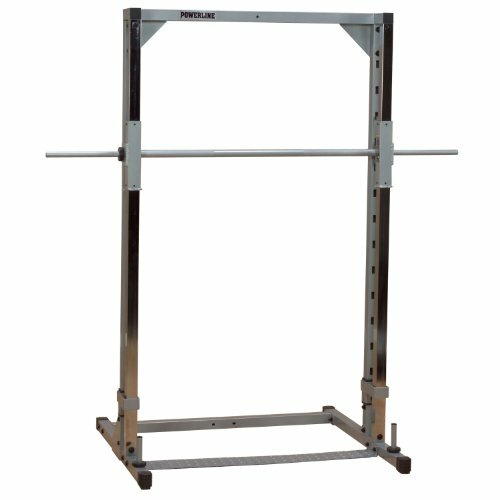 While the standard order comes with the smith bar and frame, there are options to add additional equipment. You could add an adjustable bench, pec dec, and pulley system. This gives you room to expand the smith machine’s workout features as time goes on. It’s a feature that people on tighter budgets will appreciate the most. The Inspire Fitness FT2 provides an incredible amount of high-quality workout features. I especially liked how you can use up to 800 lbs in total. Having said that, it is one of the top-range smith machines – so it’s pricey! People working with a more moderate budget will actually be in for a treat with the Weider PRO 8500. There are tons of workout features that are awesome, especially when you consider the price. 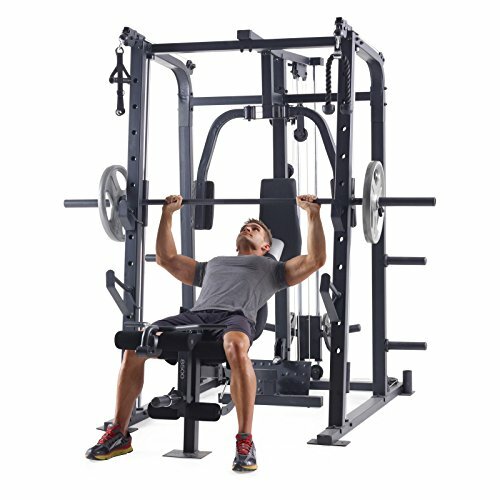 The Powerline smith machine is incredibly affordable. It offers the basics of a smith bar and solid frame – which is enough for some. Be sure to consider all of the features, pros, and cons of all three smith machines in this review. It’s also a good idea to think about your experience level. The longer you’ve been lifting, the more workout accessories and weight you’ll need. The less experienced you are, the more basic your workouts can be. You may also be interested to see what these Marcy and Golds Gym smith machines have to offer too.